​Soul Friends, I would love to invite you to join us as we host a new 5-week On-Line Book Study for my friend and author, Sue Detweiler. ​Her latest book, 9 Traits of a Life Giving Marriage, answers a resounding "yes" to the question, "Is it possible to enjoy a strong and healthy marriage--'till death do you part?" It's not too late to join our study! Click here to sign up. This will also get you into our special Facebook group, open only to study participants. On Mondays and Wednesdays beginning January 11, please visit Sue's blog for a special video message and your weekly study download. ​Then on Thursday evenings, in our private Facebook group, we are hosting a LIVE CHAT from 9:00 - 10:00 pm CST. 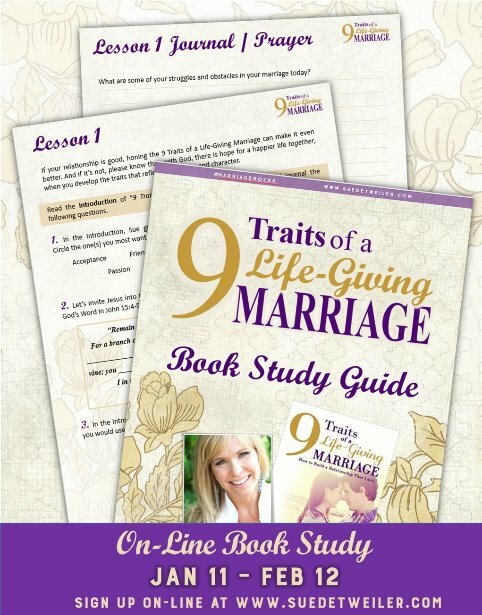 To order your copy of 9 Traits of a Life-Giving Marriage book, visit Sue's blog. Don't have the book? Come join us anyway! There’s still time to also invite your friends to join you for the Study! 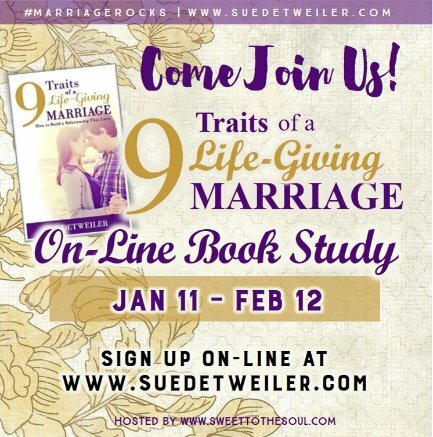 All participants and fb group members receive this FREE Book Study Guide to follow along with our On-Line Book Study of 9 Traits of a Life Giving Marriage by Sue Detweiler.